Ranger Springs at the Head of the Rogue River - Explore! Ranger Springs at the Head of the Rogue River - Explore! Oregon’s Rogue River begins its 215 mile journey near the crest of the Oregon Cascade Mountains. It passes the towns of Prospect, Eagle Point, Grants Pass and Agness before entering the Pacific Ocean at Gold Beach. Near Prospect the river’s three upper branches split with each reaching high into the mountains. 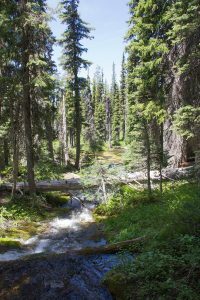 In this article, we’ll explore the headwaters of the Middle Fork of the Rogue River at Ranger Springs. 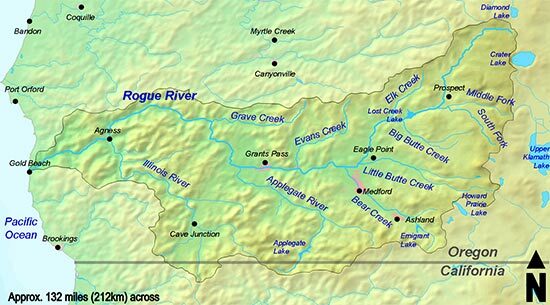 The map above displays the entire Rogue River Watershed. Click the map for a larger version. 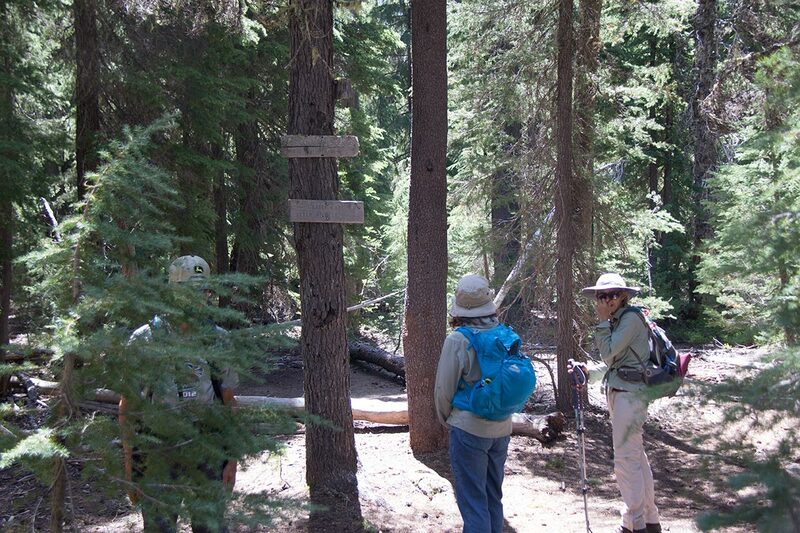 From the trailhead on Sevenmile Creek, the trail makes a gradual climb to the Pacific Crest Trail. 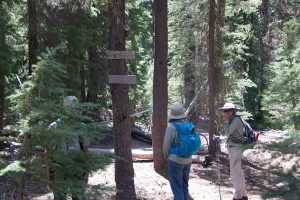 After following the PCT northward a short distance, the Ranger Springs Trail branches to the west and leads directly to the springs on a slightly downhill grade. On this trip, July 2, there were still a few patches of snow hidden in the forest. Unfortunately, the Ranger Springs Trail had not been cleared of trees. It was covered in many places with fallen trees that necessitated either climbing or detours. In situations like these, your pathfinder needs to take a moment to assess the situation. Sometimes it’s easier to step over a few tree trunks and sometimes it’s best to detour around the trees. Sometimes the best route is around the roots and sometimes it’s around the top of the trees. 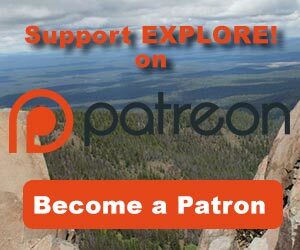 Your pathfinder will make the best possible choice, given what can be seen, and set off. Along the way, the path may change a few times as new barriers or easier opportunities are discovered. Eventually, you will get back to the trail, but in situations like this it takes a lot more effort than simply walking on a clear trail. Fortunately the other trails were all clear. 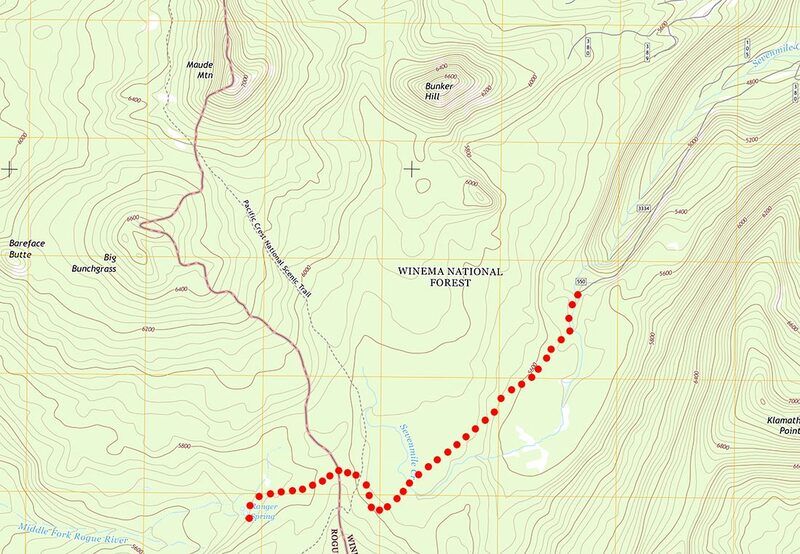 The map below shows the trail as red dots as I tracked it on my iPhone’s GPS system. I measured the distance as 3.60 miles each way. Click the map to see a larger version. As one nears Ranger Springs (as named on USGS maps) the trail passes several small seeps and wet meadows. 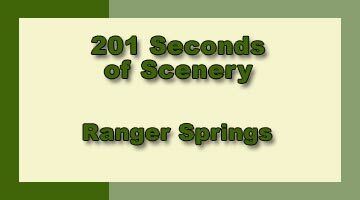 Don’t confuse them with Ranger Springs – it is much more impressive. There is also a horse corral, apparently associated with the old camping spot for fire guards. 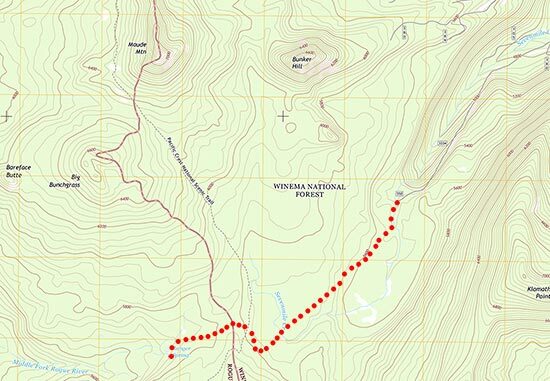 The trail itself passes immediately adjacent to the largest of the springs. The photo to the left was shot while standing on the bank just above the largest spring. The very cold water you see is boiling out of the ground in front of my feet and forming the flow you see spilling over that first log. Behind the second log and between the two saplings on the right is a tree that has another large volume of water boiling from among its roots and adding it’s flow to that of the first spring. There are several smaller springs and many seeps adding to the flow as it heads toward prospect and the main stem of the Rogue River. You’ll need to watch the video below to get an idea of the noise that this flow of crashing water creates. As one explores downstream, the flow slows and the noise subsides. At the same time, the river widens and begins to meander. The photo reveals the water flowing around some trees in the background. This suggests that the water is not always this high. Being so high in the mountains, the water can only be coming from snowmelt above the springs. 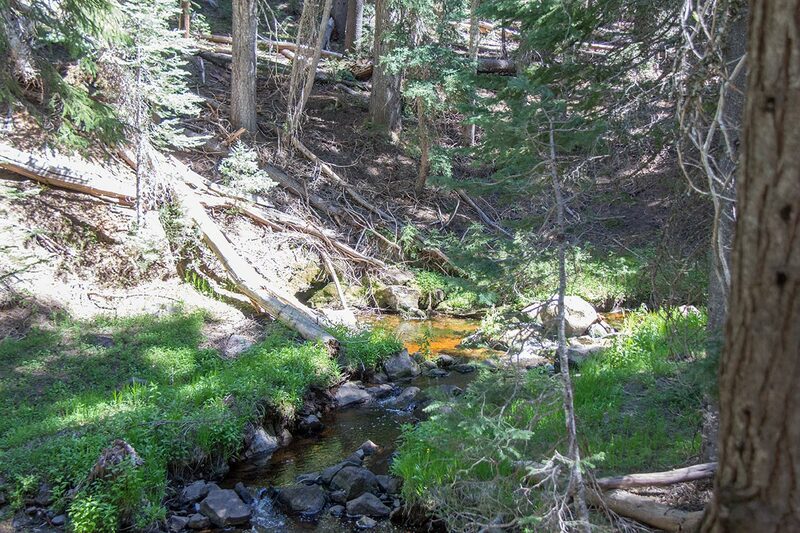 As the snow disappears and the water makes its way through the soil and into the underground channels that lead to the springs, the flow should gradually decline to a much lower level later in the summer. 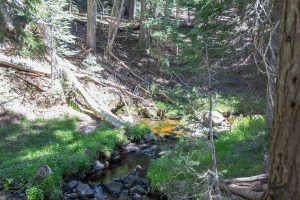 Our video provides a brief look at Sevenmile Creek and the Trail to Rangers Springs. Then we offer several views of the springs and the extent of the water moving out of them. There is little musical background to this video because the changing tones and volume of the rushing water creates its own music. For a higher resolution version, check out the video on YouTube. 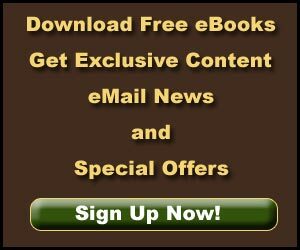 All photos, the trail map and the video were created by Jerry Haugen and are ©2016 Global Creations LLC, All rights reserved. The watershed map is by Demis Map Server, Little Mountain 5 (CC BY-SA 3.0 or GFDL)]. 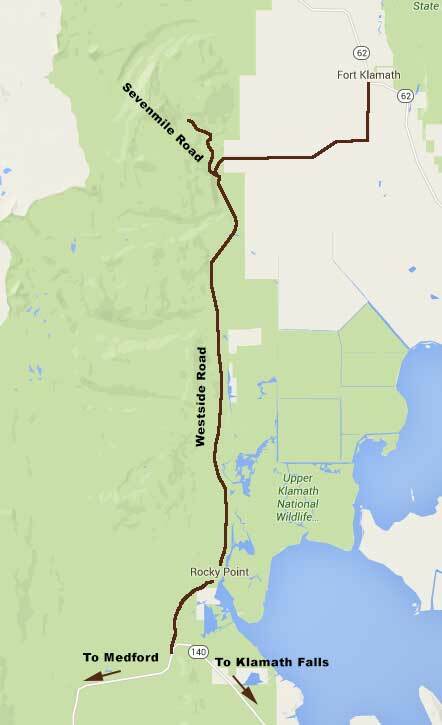 The route map was created from Google Maps by Jerry Haugen.